The Urban Politico: A Rebuttal to The Root re "Black-on-Black Violence"
A Rebuttal to The Root re "Black-on-Black Violence"
I am not rooting for the knucklehead. Actually just the opposite. I refuse to be responsible for his actions. I refuse to be expected to explain his/her actions. It is not my responsibility more than anyone else in this country who is a citizen. This is the definition of agency--to exercise your full rights as citizens. If we were in some black nation within a nation that might make sense to "self-police." Then we'd have a "black tax" to pay "black officers" etc. I pay U.S. tax and local tax and that is who is responsible for police work. The sooner everyone, black white, yellow red, whatever realizes this the better. It's NOT an academic debate. Non-black people don't get to look the other way. It's their country---and their problem too. Just like its ours. Black on Black crime isn't restricted to just the judicial system element of crime itself. It speaks to a larger issue in the black community. If the crime rate was consistent with the crime rate in other races, then I would agree with the author. But making up 12% of the population and dang near 50% of the murders speaks to a larger, deeper issue within the black community. Something in the community is dysfunctional. It goes past the actual perpetrators and starts to seep out into society as the RULE and not the exception. It becomes a representation of how we are in the minds of many. Many white people think that black males are very violent...why is that? Because a white man killed another white man as the author's comments suggest? After all, it is just another crime right? Of course not, it is because of black on black crime. Black on black crime has social, economical, environmental, and a spiritual impact on the black community. We are more likely to go to prison, get a harder sentence, get the death penalty, not get paroled, etc. For those that DON'T break the law, we are more likely (than our white male counter parts) to not get a job, promotion, or respect in part due to the perception that we are violent. Hell, even Obama can't get pissed off about BP because he can't be seen as the "Angry Black Man." This issue has an impression on the WHITE HOUSE, and you STILL want to dismiss it as "just a crime?" Okay, how about we bring it closer to home. Remember that "there are no good men?" If nothing else, black on black crime should be lower, we need more positive brothers out there. Brothers, who aren't in prison, who are contributing to the community, being good role models, and husbands. Does this mean that those black men DIDN'T do the crime? NOT AT ALL! If you believe that there is an equal distribution of crime across the races, then you should, at the very least, be concerned with the unfair distribution of the arrest rate and punishment among black men. The data shows that blacks are more likely to be arrested and convicted. So, should we just ignore the fact that blacks aren't treated the same as whites in the justice system? I'm sure glad you are not a representation of the blacks in the 50s and 60s - we still wouldn't be able to vote with your approach. To me, the REAL crime is the apathy and dismissal towards the issue. I'm not suggesting that you put on a cape and cowl and go fight crime, but ignoring the issue makes it worse. "The greatest trick the devil ever pulled..."
Before I dive in, I just wanted to point out one minor issue that irked me as a stickler for detail: The Root article cited to one of our previous posts about Black-on-Black crime (HERE) and then apparently quoted us as saying "we gotta do better," when in fact, we actually said "we really need to do better." Now, in the grand scheme of things, does this minor discrepancy make any difference whatsoever? No, of course not. But if you've "gotta" quote us, get it right damn it! Sure, Whites and Blacks are equals in terms of their legal rights, to be sure, but socially the two groups have never been on the same footing, even within the same socioeconomic brackets. The social ills of one group, such as "Black-on-Black" violence (or whatever nomenclature you care to use in order to define it) have nothing to do with the social ills of the other group. So we can't say, just because White people don't have problem X, then we should likewise not have problem X. First of all, we're not White. Which means, we do not constitute the majority population of America or receive any of the perks or privileges associated therewith. In other words, we don't have the luxury of playing the "we're all just individuals" card. Problems, such as Black-on-Black violence inform the majority's opinions and policies towards our community whether we like it or not. Now don't get me wrong, I would rather that race DIDN'T matter. 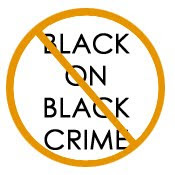 I would rather that there was no need to be cognizant of Black-on-Black crime. The scenario you advocate towards in your article sounds like a nice place to live. The only problem is we live in a country that has been burdened with the issue of race since it was founded.